At 12-0, Arizona basketball is ranked No. 1 in the country while the football team prepares to play Boston College in the Advocare V100 Bowl. TUCSON, Ariz. — It was just more than a year ago when the Arizona football team came back to beat Nevada 49-48 in dramatic fashion in the New Mexico Bowl. A few hours later, at McKale Center, the UA basketball team stunned No. 5 Florida, 65-64, on a last-second shot. It will long be regarded as one of the best, if not the best, days in Wildcats sports history. Athletic director Greg Byrne rattled off the date like a child’s birthday: "12/15/12." Every day should have that ring to it. Now, a year later, everything seems even better. How do you choose between a great day and a year of many very good days, like the ones Arizona is living through right now? "I think we have a chance to have a pretty good year," Byrne said. In recent days, Byrne, ever the social media boss, said he’s seen UA athletics on the front of prominent sports websites more than a few times. "It helps with our branding," he said. 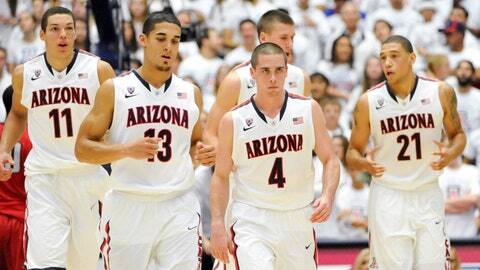 Arizona basketball has become the top-ranked team in the country. It’s almost impossible to accurately measure the impact it has on you. The impact on the program is outstanding. Top recruits will have us in their thought process. The basketball team’s success has an impact on a number of factors: the Wildcat Club, season tickets, licensing and many other things. The football team has returned to its second bowl game under Rich Rodriguez. Junior running back Ka’Deem Carey, one of Tucson’s own, was named a consensus All-American for the second straight year. The Wildcats finished their first season in their recently completed $72 million football stadium, which Byrne called "a great tool for recruiting" and the fan experience. Said Rodriguez: There is a lot of excitement, and this (Arizona Stadium) is a big deal for us," Byrne said. "And bringing in bunch of new guys in that I think we can build a program around. And it’s been an enjoyable year for the seniors. Yes, there have been some missteps, but I think we’ve built a pretty good base." Arizona has long had a solid base at McKale Center, but now the athletic department will start on its $30 million first-phase renovation project for the aging arena after obtaining a $6 million donation. More is likely to come soon; it’s expected that an eventual $80 million will be poured into the 40-year-old facility. "We’re just modernizing it, and we’re in the first big steps to making that happen," Byrne said. New, larger video screens will be installed in less than two weeks, and new seats and a new floor — among other enhancements — will be ready for next season. So things have been going pretty well for the Wildcats, and for Byrne. "I feel fortunate to play a tiny role," he said modestly. "I’m serious. It’s the talent of our student-athletes and coaches. It’s the talent of our entire department and passion of our fan base that creates a place where kids want to part of." Having the top-ranked basketball program helps, especially as football fades into the background and hoops grabs a larger portion of the fan consciousness. You get front-and-center play on national websites, and you get to be the talk of the nation on game day. It’s an immeasurable amount of publicity. "It’s almost impossible to accurately measure the impact it has on you," Byrne said. "The impact on the program is outstanding. Top recruits will have us in their thought process. The basketball team’s success has an impact on a number of factors: the Wildcat Club, season tickets, licensing and many other things." He adds that increased visibility in the sports programs — from things like Final Four runs and bowl games — leads to increased applications for the general student body, as well. "That means a positive financial impact on the school and the city of Tucson," he said. "It’s good for southern Arizona and the state. It’s good visibility. Is it better to be known for being a national champion or for politics? The (former) may be the one." Of course, it hasn’t all been positive; there have been a couple disappointing losses on the field to in-state rival Arizona State. But the basketball team, at 12-0 and rolling, has helped ease that pain. "We’re a long ways away from the finish line," said Byrne, referring to the basketball season. "But we’re in a good position at this time of year." Football is, too, given that in less than two weeks, Arizona will be in Shreveport, La., for the AdvoCare V100 Bowl to face Boston College. It could be Carey’s last game in uniform, as he’s considered one of the top running back prospects eligible for the NFL draft. He’s already filed paperwork to get a grade from the NFL Draft Advisory Committee. "We had the highest APR in the Pac-12 last year," Byrne said. "Those types of numbers will have an impact on your graduation rates. "And we’re very excited with what we are doing in recruiting, too." There are, as always, a few things that could use improving. Arizona still needs to figure out how to get fans into the stands. On at least two notable instances, UA fell way short on attendance. Against Oregon, in what turned out to be a huge Arizona upset, there was announced crowd of 45,777, and that came at a time when the Ducks were considered one of the best teams in the country and were on the periphery of the national championship discussion. That came on the heels of only 42,080 showing up to see the Wildcats face Washington State. Arizona must find ways to get fans to get to the games — and stay. Plans are in the works, according to Byrne, who said he feels he has a "very loyal 40,000" fans. It’s really about getting another 15,000 or so to join in. "We need people who come to the tailgates to go to the games and those who have tailgates to encourage them to get tickets," Byrne said. "We want them to have that camaraderie of the tailgate and then take it into the game. Not just have that camaraderie and then go home." Keep in mind that winning always helps bring fans out. And in that regard — among many others for Arizona — while life isn’t perfect right now, it’s pretty good. "One of the things I think about when I get up in the morning is, ‘I hope that I’m hard to replace when the time comes for me to be done here at Arizona,’" Byrne said, adding, "but I’m replaceable."